Cladding on student accommodation being built in Newcastle is to be changed after it emerged it was the same as that used on London's Grenfell Tower. The Shield originally included Reynobond ACM PE panels, which were also used in the block of flats where at least 80 people died on 14 June. 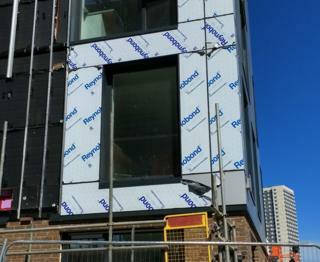 Developer BAM Properties Ltd had stressed the cladding material "met all fire safety and building regulations". However, it said it was being removed to "reassure future occupants." At its highest point The Shield will be taller than 18m - which is the maximum height the government has said such cladding should be used. The Department for Communities and Local Government has said cladding of a composite aluminium panel with a polyethylene core would be non-compliant with current building regulations guidance. In a joint statement BAM Properties, contractor BAM Construction and owner Curlew Capital said the cladding would be replaced immediately. It said: "We have every confidence in the safety of The Shield building as designed and built and it has achieved completion certificates confirming compliance with building regulations. "However, we appreciate that the recent publicity surrounding the use of Reynobond panels on the buildings may cause concern to future and potential occupants, pending the outcome of the investigations into the causes of the tragic Grenfell Tower fire. "The student accommodation market in Newcastle is highly competitive. Our scheme offers a very high standard of accommodation and we do not want any concerns to stand in the way of its attractiveness to students. "In order to reassure occupants, the parties have decided therefore to remove the Reynobond cladding panels from the scheme. They will be replaced with solid zinc panels. "The process will take approximately 14 weeks."